The sun shone and the atmosphere was terrific. To our surprise and delight the golf tournament raised just under £6000 and this was further bolstered by an incredibly generous donation of £2,500 which brought the total for the day up to £8,500. This is by far the highest amount we have raised to date. 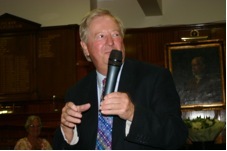 With a full complement of teams during the day and a full house for our tournament supper in the evening in the company of our Patrons, Tim Brooke-Taylor and his wife Christine and Simon Groom and his wife Gilly, the event had to be an outstanding success. Brian Corfe, Mary Bird, Christine and Tim Brooke-Taylor – they just had fun!